Slow food meets super-simple DIY gardening in this organic mushroom kit. With just a spray of water once a day, you'll grow delicious oyster mushrooms in as little as 10 days-literally right out of the box! It has everything you need to grow your own gourmet mushrooms for salads and recipes, including a natural soil substrate composed of recycled organic material like corncobs, wheat bran, and oak shavings. The package even includes a tempting mushroom taco recipe, so you can enjoy your produce right away. Made in Oakland, California. Please note: These kits contain living mushroom roots, so don't be surprised by what's inside! Most kits, when opened, will contain a white substance; this is the healthy mycelium (mushroom roots) ready to grow as soon as it's slit open. Kits are inoculated with oyster mushroom spawn after being thoroughly sterilized. Mushrooms grown in a high altitude or dry climate might require a little extra attention. 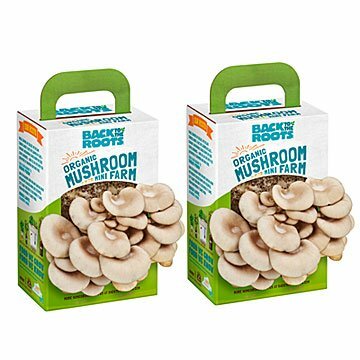 Soak the bag for at least 24 hours, spritz at least to 3-4 times per day and give your mushrooms a home in your garage, basement, closet or cupboard to avoid exposure to increased dryness from heating and AC systems. Please note: not for customers or recipients with mushroom allergies. Could take up to as many as 30 days to sprout. Oyster mushrooms - the kind contained in the kit -love fresh air. Bought for Christmas gifts! Very unique! Arrived quickly! We kept it on in the kitchen and had fun seeing the changes every day. We followed the instructions and have waited for the mushrooms to start. I noticed mold after the 1st couple of days. There is also a bunch of white (looks like it could be the mushrooms starting). Today, most of the white is turning green with mold. It has been fun to watch, but we were looking forward to eating the mushrooms. Does not look like this is going to happen. Something to share with the whole family. Even the grandchildren with the watching, the harvest the cooking. Just like the little red hen with cooperation. Thought I had reviewed previously, sorry if this is somehow a second review by me. This product is excellent, instructions were very clear, easy to follow..... product began to show signs of pinning from 5 or 6 days after being soaked..... quicker than I thought it would! Mushrooms are growing like crazy! Definitely a fun project, and when I reviewed i hashtagged #GrowOneGiveOne as they will send one to a school classroom of my choice! Can't wait for the kids to start growing their own shrooms! Very happy with this purchase, reasonable price too! We love these little mini mushroom farms! I gave one to my son in law for his birthday, and i kept the other. They are producing like mad, can't wait to cook with the mushrooms! Was given another chance to grow these mushrooms, but had the same problem as before. They molded in two days. Easy to grow and fun to eat! Sooooo easy to grow and taste great. I love this idea; Oyster mushrooms are delicious and versatile in cooking and I was excited to grow my own mushrooms inside in the Winter, when my garden is dormant. After following the soaking instructions, tiny mushrooms began to sprout in a few days and it was fun to find them doubled by the next morning. You MUST remember to water each day.. By the 7th day, some of the mushrooms started to dry up and I was forced to use them right away. The entire crop was just enough for a small serving, so I added them to a recipe. While I didn't get enough mushrooms to justify the cost of the product, this is still a delightful novelty for Winter fun. I am now waiting to see if the "bonus crop" will grow with a second soaking. Slow food meets super-simple DIY gardening in this organic mushroom kit.